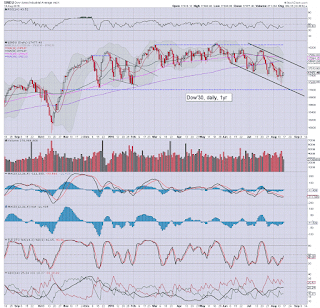 US equities closed moderately higher, sp +10pts @ 2102. The two leaders - Trans/R2K, settled higher by 0.7% and 1.1% respectively. With the break above declining resistance, near term outlook is moderately bullish into this Friday's OPEX. Nothing to add... on what was - from a technical perspective, a far more bullish day than last Monday. a daily wrap at 8pm. A lousy day to start the week, and from a technical perspective, this is way worse than last Monday's nonsense. For me... I'm writing off the rest of the week. Summer will be wrapping up in 3-4 weeks... and then its 6-7 months of meteorological gloom. Is it time for clinical depression yet? The sp'500 has decisively broken about the declining trend, with a daily close above the key 2100 threshold seemingly likely. Equity bears look toast for rest of the week. VIX is once again reflecting a market that is usually only moderately concerned for mere hours.. never mind days. 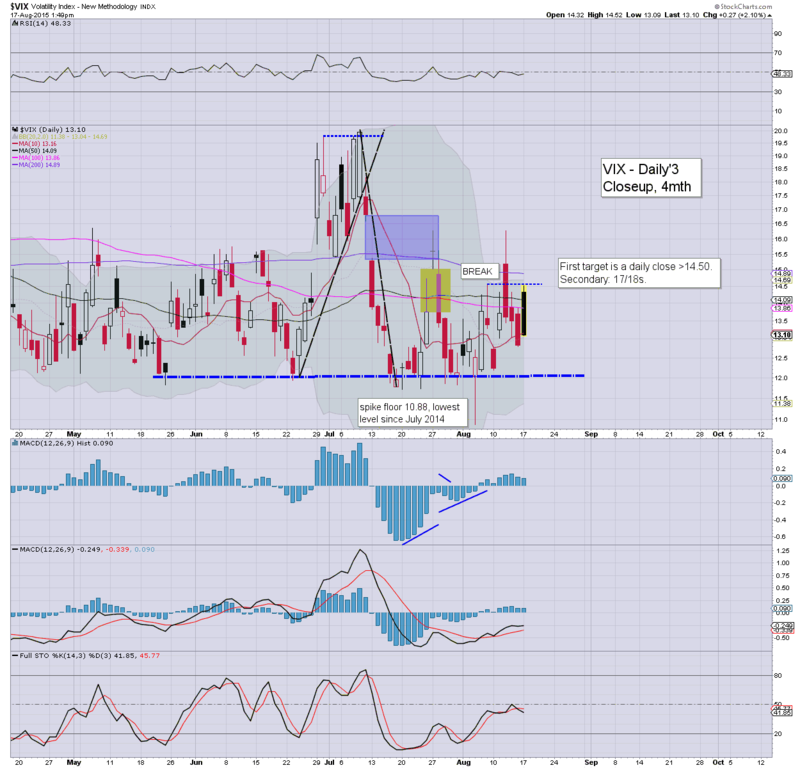 *the large black-fail candle on the daily VIX chart tells the tail... a total equity bear FAIL. 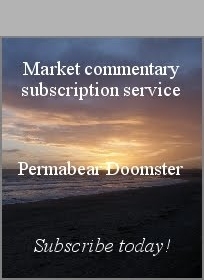 A market that can shake off any moderate concern within a mere hour or two. 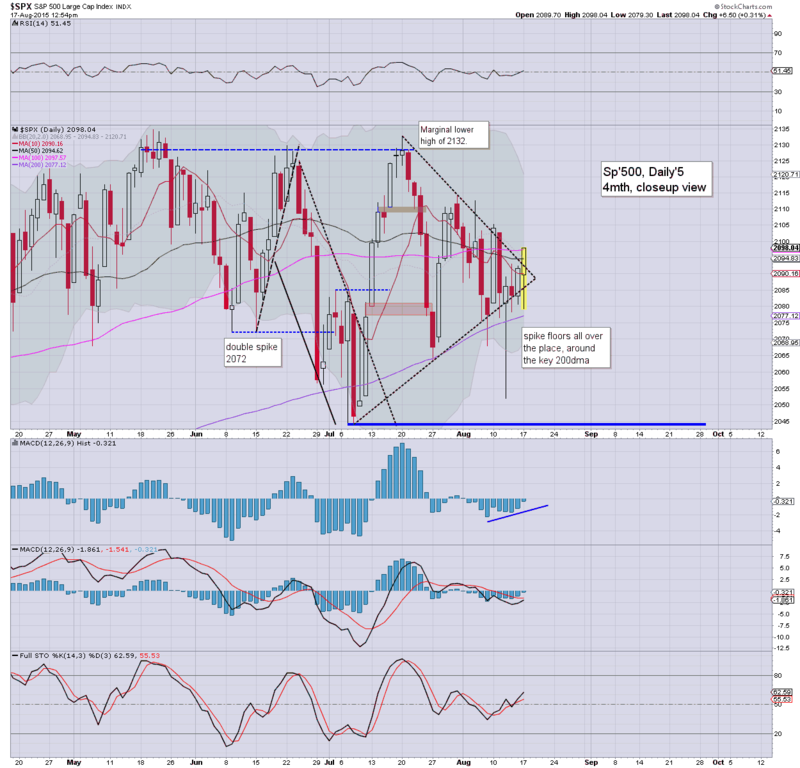 A major equity bear fail today... and unlike last Monday... the sp'500 has achieved clear break above declining trend. At the moment, it appears bears can write off the rest of the week.. not least since it is opex week. The sp'500 remains somewhat stuck around declining resistance, +6pts @ 2098. 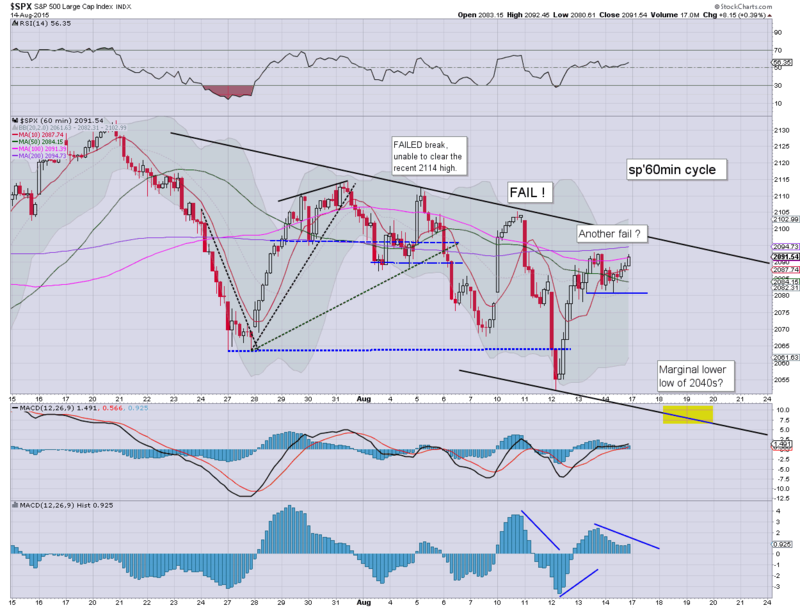 A daily close above the 2100 threshold would bode for continued upside into this Friday's opex. Gold is holding gains of $4, whilst Oil +0.6% in the $42s. The daily candle is starting to look rather scary, with a clear spike floor.. again.. above the key 200dma. The upper bollinger at 2120 is obvious first target for the bulls, but that is declining rather rapidly. VIX +2.8% in the 13.10s... and now looking like its set to turn red. The 15s - which looked viable at the open.. are now a long way up. 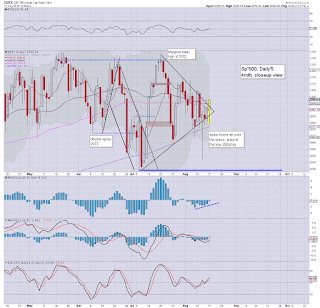 The sp'500 is at key resistance of 2097, a daily close would bode strongly for the bulls for the rest of the week. 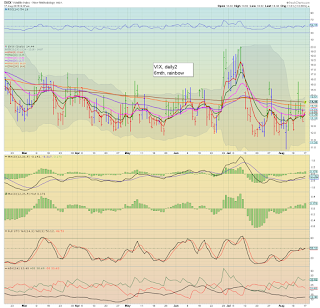 VIX is reflecting a market that is only fractionally concerned, +3% in the 13.20s. The big 20 threshold looks out of range for some weeks. It remains a lame.. and frustrating start to the week.... although somewhat less disturbing than last Monday. Near term trend is clearly bullish... if the market is going to rollover again.. it needs to happen from current levels.... as there will surely be a truck load of short-stops in the low sp'2100s. With no sig' downside power, the bull maniacs have already managed to turn most equity indexes fractionally higher. Key resistance remains around the sp'2100 threshold... a mere 0.5% higher. 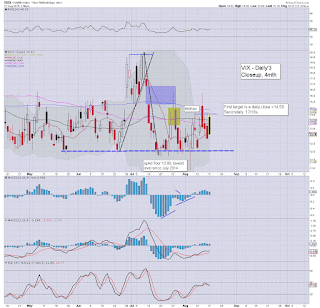 VIX saw an opening hourly black-fail candle.. reflective of bearish exhaustion. Suffice to say... a truly lame opening 90mins for the bears.. as especially reflected in the VIX. notable strength: miners, GDX +2.3%... as Gold holds minor gains of $3. weakness, oil/gas drillers, RIG/SDRL, both lower by -1.5%.. as Oil battles to hold +0.5% in the $42s. 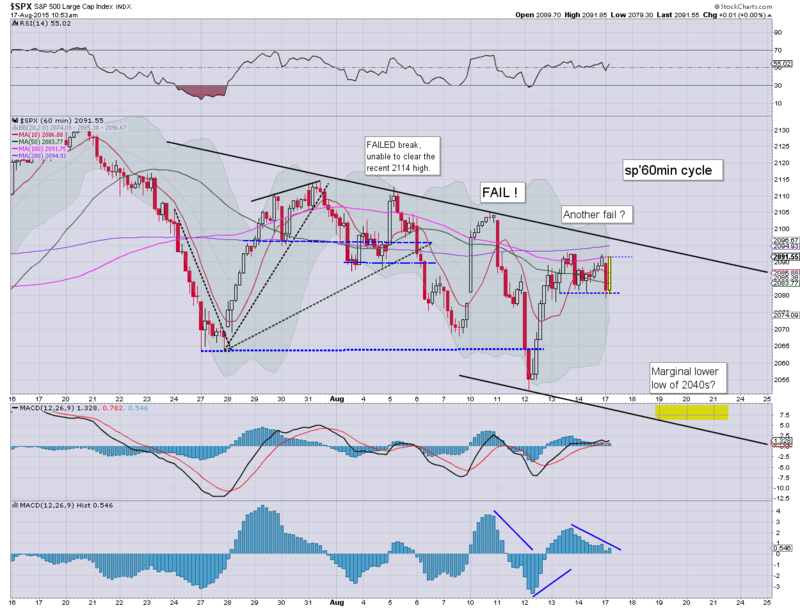 US equities open lower, with the hourly cycle offering downside across the day. 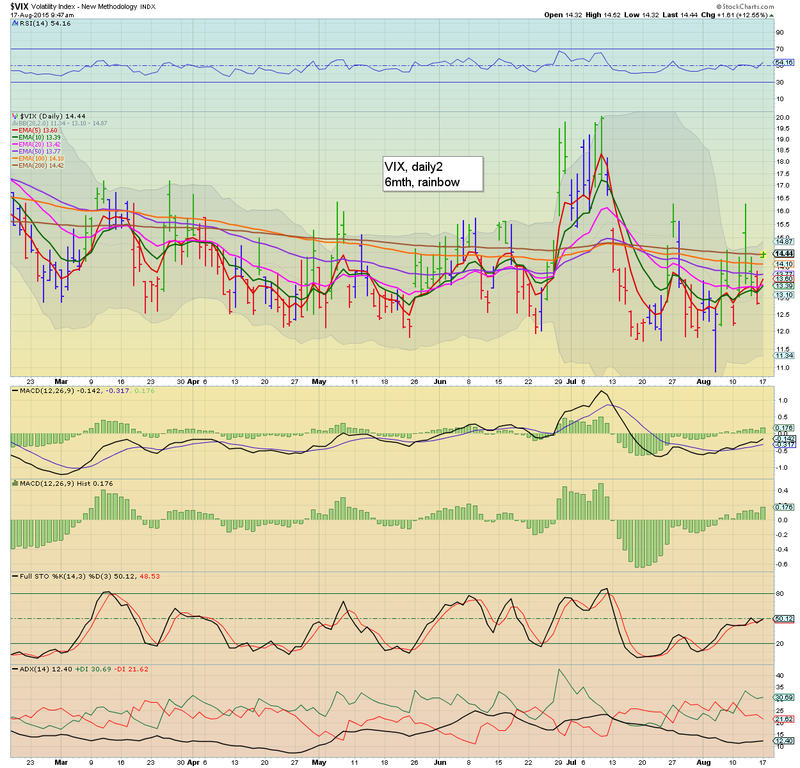 VIX is reflecting some moderate market concern, +12% in the 14.40s. Metals are holding moderate gains, Gold +$6, whilst Oil is somewhat choppy, currently -0.1% in the $42s. 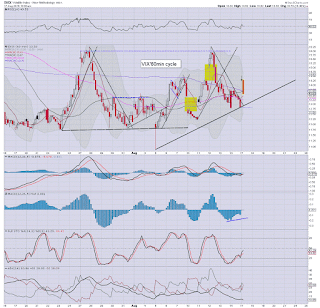 Eyes on the VIX, a daily close >15.00 would be suggestive of 17/18s tomorrow.. with sp'2040s. That is probably me being 'overly bearish'... but a move to Dow 17000 - equiv' to sp'2040s (and VIX 17/18s) seems the most natural thing for the market to do in the near term. A Mon/Tuesday washout... and then clawing higher into OPEX Friday? Regardless... we sure ain't breaking >2100 this morning. time for an early lunch... or I'm not going to make it through the day. 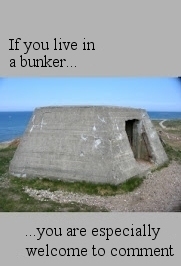 10.18am.. 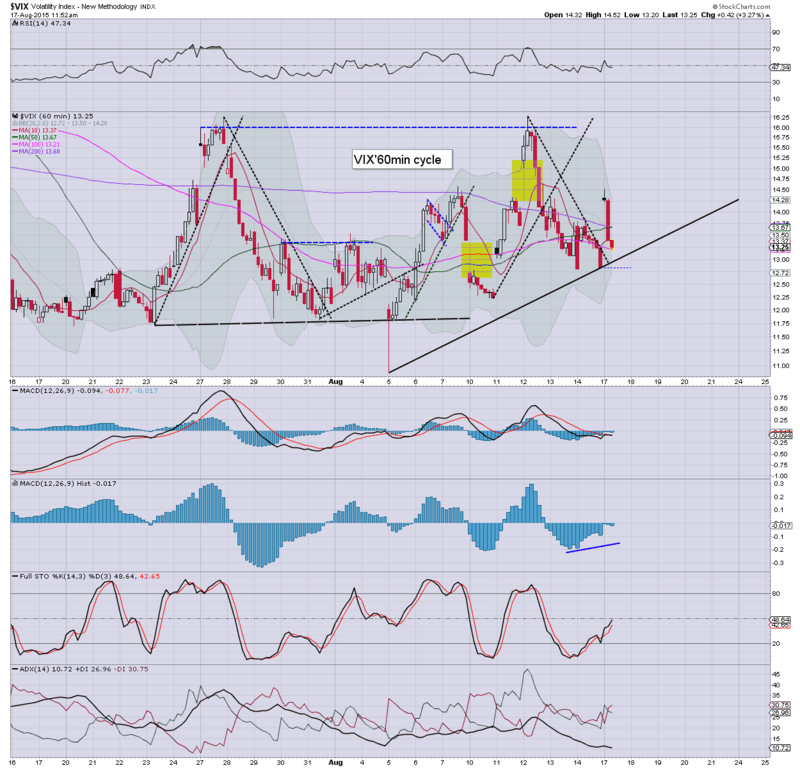 Opening hourly black-fail candle on the VIX.. to those watching.... a clear fail for the equity bears. With no sig'/sustained downside power... that could be it for this week.... lame open. Good morning. 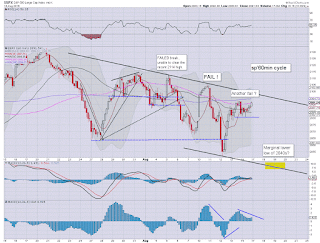 Equity futures are flat, we're set to start the week at sp'2091, a mere 7pts from key resistance. USD is +0.2% in the DXY 96.70s. Metals are a little higher, Gold +$2, whilst Oil remains weak, -0.2% in the low $42s. Well, its opex week, and there is a high possibility we'll just churn around. I realise many are seeking the sp'2110/20s.. but if we do break above resistance (>2098), then why would it stop there, rather than go to the 2150s.. or even higher? As a collective, new highs in the main market look extremely unlikely.. and I'm rather dismissive of sustained strength >2100. notable early mover: TSLA +4.5%... did they sell two cars this weekend? If so.. thats another $8000 loss. I am no fan of the Mannarino, but there are some interesting points made in this. Overnight China action: after some morning weakness, the Shanghai comp' battled higher into the afternoon, settling +0.7% @ 3993. Again, its clear there is resistance around the 4K threshold. 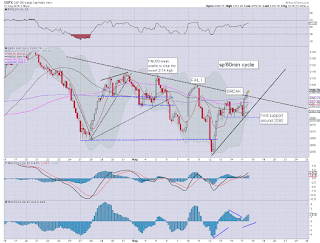 Most agree, there will be heavy resistance in the 4000/4500 zone. 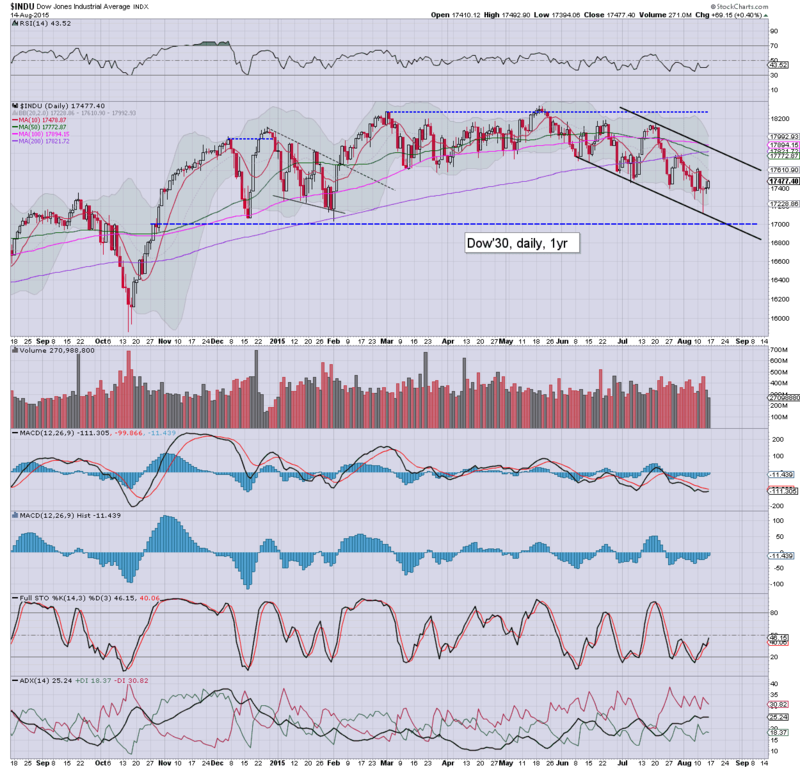 I remain of the view that 3200/3000 looks a relatively easy target... given another major wave lower by early October. 8.31am .Empire state manufacturing: -14.9, vs. +4.75 expected. .. the lowest level since April 2009 (according to Bloomberg). I'm not sure what to make of it, other than 'economic boom'... sure ain't the case. 8.33am... Market seems to be increasingly upset at the number.... sp -6pts.... 2085. A break <2080 would be rather important for the bears... but especially so.. a daily close in the 2070s. 9.36am.. a break of 2080.... next stop 2070/65 zone. VIX jumps 13% to 14.50.... marginally interesting.